Paul Rudovsky, left, stands on the 3rd green of The Cradle with Pinehurst Country Club member Jim Rohr on Wednesday, Oct. 18. The Cradle was the 1,000th golf course Rudovsky has played in his lifetime. 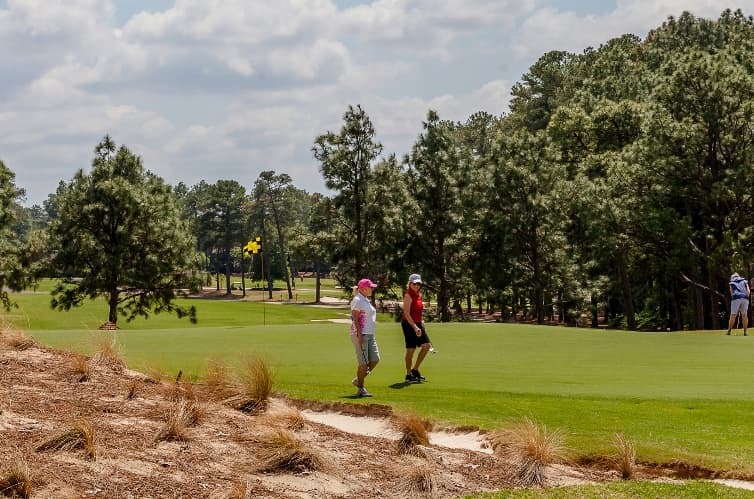 Recently, Paul Rudovsky played his 1,000th different golf course: The Cradle, Pinehurst’s new 789-yard short course. But that’s only one of Rudovsky’s incredible achievements in golf. Sixty-two years ago, when he was 10 years old and away from home at summer camp, Paul Rudovsky was presented with a choice. “And it changed my life,” he says. Enjoy a round of golf, resort accommodations and our famous breakfast buffet each day of your stay starting at $199 this winter. Six decades after playing nine holes at Honesdale Golf Club in eastern Pennsylvania, Rudovsky, a retired executive who has made his home in Pinehurst for about half the year since 2000, accomplished a feat few golfers could ever envision, let alone achieve. Rudovsky played his 1,000th different golf course: The Cradle, Pinehurst’s new 789-yard, 9-hole short course. It was not a decision Rudovsky took lightly. “When I finished No. 999 (Bulle Rock Golf Course in Maryland), I said, ‘I’ve got to figure out where to do 1,000,’” Rudovsky says. “I came down to three possibilities – one was The Cradle, one was St. Andrew’s in Yonkers, New York, which is one of five founding clubs of the USGA … and maybe Streamsong Black, the new one. And that’s where Rudovsky was one Wednesday afternoon, reaching his personal milestone while playing alongside Pinehurst Country Club member Jim Rohr. With a graceful swing, Rudovsky carried three wedges and a putter around The Cradle, playing each shot mindfully and with a jovial banter. He finished with a near hole-in-one on the tricky 9th hole, tapped in for birdie and collected his deuce, six 3s and two 4s into a tidy 1-over 28. The Cradle, Pinehurst’s 789-yard, 9-hole short course designed by Gil Hanse. Numbers and organization, you see, are important facets of Rudovsky’s life. When, in the late 1960s, golf publications became reviewing courses and making Top 100 lists of the greatest courses in the world and United States, Rudovsky did what most people who casually glance at the annual and biennial lists tend to do – he began checking courses off. But Rudovsky has never settled. He began compiling another list, and then another list, and even though he’d put the lists away for a few years at a time, he’d always return to them. And with that, Rudovsky, who’s played everywhere anyone has ever wanted to possibly play, looped his Sunday bag over his right shoulder and began another loop around The Cradle. Then, when actually forced to lie low for a period, Rudovsky’s mind really kicked into gear. In the time since that 10-year-old camper looked for what he thought might be the easy way out, Rudovsky has played every golf course ever listed on a golf publication’s top 100 list. Paul Rudovsky has played every golf course that’s ever been ranked among the Top 100 by a golf publication, which, of course, includes Pinehurst No. 2. He finished the quest a year ago. The quest also taught Rudovsky a firm fundamental truth about golf.